Mayor Jim Kenney aims to raise the minimum wage in phases for some workers in the city to $15 an hour by 2022. The legislation he’s proposed would increase the minimum wage for city workers, as well as employees of city contractors and subcontractors over the next four years. Kenney said the move would help lift many out of poverty, especially those stuck in low-paying jobs, and he hoped the private sector would follow suit in raising its hourly pay. 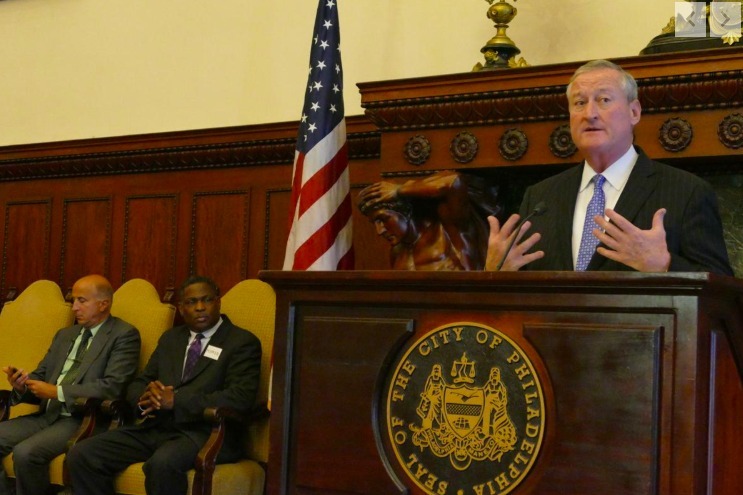 “Poverty works its way into households in insidious and subtle ways, like when parents must choose between buying shoes for their growing toddler or a decent meal for their family,” Kenney said during a press conference in the Mayor’s Reception Room in City Hall on Wednesday. Joining Kenney and the Rev. Greg Holston, executive director of POWER, in addressing the media, Councilman Mark Squilla said he would introduce the necessary legislation to advance the idea in the City Council on Thursday. If the measure is approved, Philadelphia will join other cities that have passed $15-per-hour minimum wage standards, including New York City, Seattle and San Francisco. Philadelphia’s current minimum wage for city and contractors’ employees is $12.20 per hour. The legislation would amend the 21st Century Minimum Wage and Benefits Standard, which requires the city’s director of finance to calculate the wage at the beginning of every year. The wage increases would cost the city between $16 million and $20 million over five years and affect approximately 2,000 city workers, Kenney said. The mayor did not immediately have figures for how many city contractors and subcontractors would be affected. $15 per hour as of July 1, 2022. Current contracts and union agreements would not be affected by the move to raise the hourly rate. “If we can move — by this legislation — literally tens of thousands of city contracted and city subcontracted workers out of poverty, then we are taking a valid and positive step forward to move us into a city where people are no longer living in poverty,” said Holston, whose organization has been advocating for the increase for four years. “If we show people we in the city here are doing it, it’s a lot easier to go out and ask other people to do the same thing,” the councilman said. Pennsylvania’s minimum wage is $7.25 per hour, which is less than New Jersey’s and Delaware’s. Kenney called on the state to increase its minimum pay rate. Earlier this year, Gov. Tom Wolf signed an executive order that increased the minimum wage for state workers and contractors to $12 an hour and raise it to $15 by 2024. State law prevents municipalities from setting their own minimum wage for all workers.